Great opportunity for an International Operations Coordinator to work with our busy and growing client in Carrollton, TX on a direct hire basis. In this position, you will be responsible for routing shipments from origin to destination via air, ocean, and truck. Chance Dower, an alumnus of the University of Texas of the Permian Basin, joined Frontline Source Group in 2010 as a full-desk recruiter and key account manager. 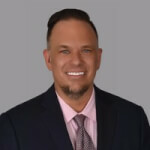 Now our Vice President of Talent Development, Chance has over 10 years of experience in the staffing industry specializing in C-Suite, Oil & Gas, and IT positions, as well as managing multiple branches throughout Texas and Tennessee. He has developed relationships with organizations and job seekers across the country, and Chance is ready to provide those resources for your search! Because every company is different, Chance goes beyond just a job description to find candidates who are the skill and culture fits for your particular needs. If you are ready to find the next great addition to your team, let Chance be your first call! Our process is designed to save you time. There’s no need to come in to register. All you need to do is submit your resume through the “Search Jobs” link or the “Upload Resume” link. If you are a fit for this role, and have additional questions, please reach out to Chance directly below.